polish insomniac: Have you entered all of my Giveaways yet? One ends tonight! Have you entered all of my Giveaways yet? One ends tonight! I have a ton of giveways going on right now, so I wanted to remind you of a few of them. One of them ends tonight, so be sure to enter now if you haven't! 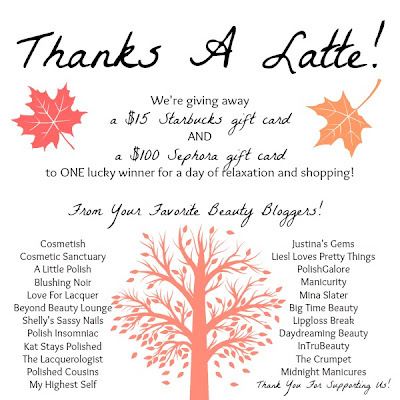 Win a $15 Starbucks Gift Card and a $100 Sephora Gift Card! Win $250 and a Lilly Brush in two colors! Win one of 5 complete sets of the China Glaze Happy HoliGlaze collection! Win a $50 Visa Gift Card from Revlon and BlogHer - Hurry ends 11/5/2013!